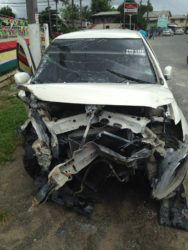 A mother of five is currently hospitalised after she was struck down by a car yesterday morning while walking along the Public Road at Sisters Village, West Bank Demerara, escaping death for the second time. Geeta Boodhoo, 32, of Sisters Village is currently a patient at the West Demerara Regional Hospital (WDRH) after she was struck from behind by a speeding motor vehicle and pitched into a nearby trench. The injuries she sustained are to her abdomen and a fractured right knee. She is scheduled to undergo surgery on Thursday. 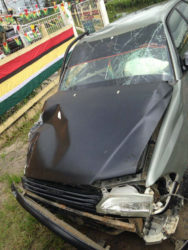 Two of her five children, Jonathan Joseph Franklyn and Varshanie Boodhoo, who were with her at the time of the incident were fortunately not injured. 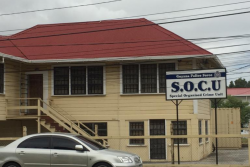 The incident occurred around 9 am yesterday while the injured woman was walking the two children to the Wales Primary School, where they were expected to start today after seeking a transfer. 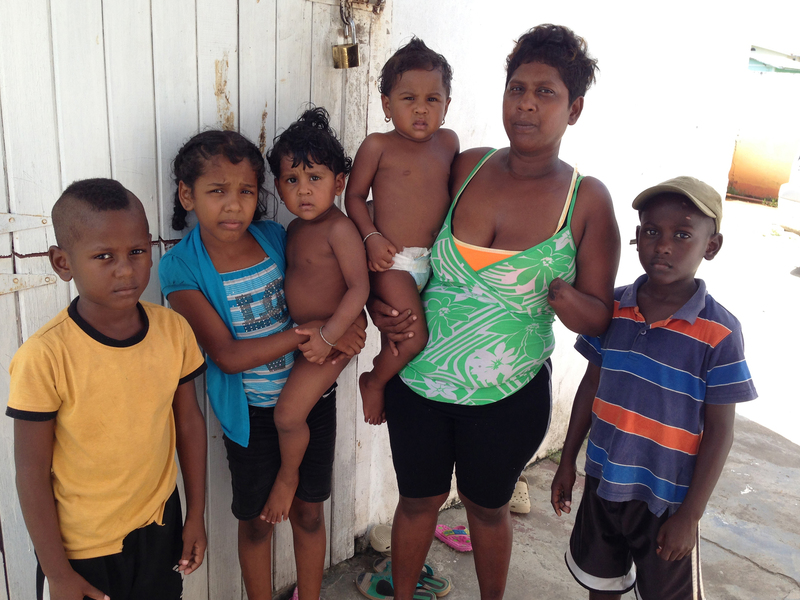 Boodhoo moved from Tuschen, East Bank Essequibo some three months ago to a rented apartment in Sisters Village. The Toyota 212 motor car, PKK 9855, which was damaged when the driver of the Raum attempted to flee the scene. WDRH, where he was admitted in a stable condition. When this newspaper visited Boodhoo at the hospital yesterday morning she was groaning in pain while awaiting to be transferred to the female ward. There were visible bruises about her body which were bleeding, and her right knee, which sustained the injury, was bandaged. She could not recall exactly what transpired after she was hit by the vehicle, only that she regained consciousness and found herself in the hospital. Her children are currently in the care of a resident in the village, who usually provides them with food and other assistance. Boodhoo was rendered disabled when she lost her left hand, just above the wrist, during a chopping incident on December 18, 2014 at her then Phase Two Tuschen Housing Scheme home, which also saw her sustaining severe injuries to her head, neck and shoulder. While she survived the ordeal, she lost her mother Zalima Khan, 55; her daughter, Ashley, 9; and a friend Floyd Drakes, 30. Her then estranged, reputed husband Joshua Franklyn, a cane-harvester who turned 45 the same day of the incident and his son Jimmy Franklyn have since been charged with the three murders. Boodhoo is in need of assistance. Any member of the public who can help can contact the woman who is currently taking care of Boodhoo’s children on telephone numbers 267-1349 or 659-6824.